Play dough is great for fine motor work! 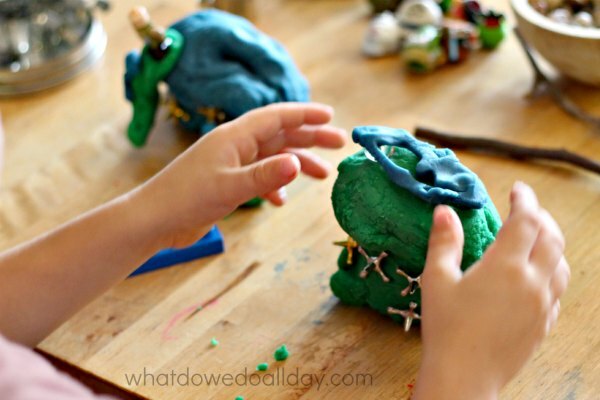 Originally I had not intended to write a post about play dough activities but as today is National Play Dough day (Seriously. For real! ), and I had these photos from a recent play dough session with with my 5 year old, it seemed like a fun idea. Perhaps this list of items will inspire your children’s free play. Long time readers (you are totally awesome) are aware that my youngest still struggles with his fine motor work. 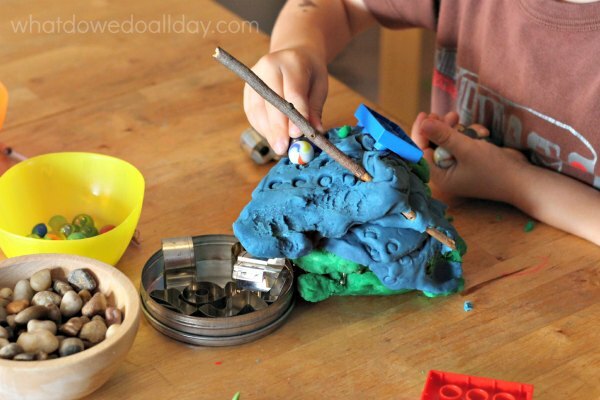 Setting out a batch of play dough with small objects is an invitation for him to engage all those small motor muscles that are so important for handwriting skills. On this day I decided to make my very first batch of cooked play dough! Can you believe it? How very ambitious of me. I’ve always made no-cook play dough in the past, but WOW, the difference is huge. Cooked play dough isn’t actually all that hard and it is way, way better. I may never take the lazy way out again! Mix all ingredients in a saucepan over low heat until the water is absorbed and it forms a ball. Remove from pan and let cool. Knead until smooth. I made two colors (blue and green – as you see). No need to wash the pot in between batches! While just a ball of play dough is good for fine motor just from squeezing and shaping it, my son is not very interested in simply sculpting the dough, so I entice him with a variety of small items. I’ve found lots of inspiration from things lying around the apartment. (One of the benefits of not being neat and tidy.) 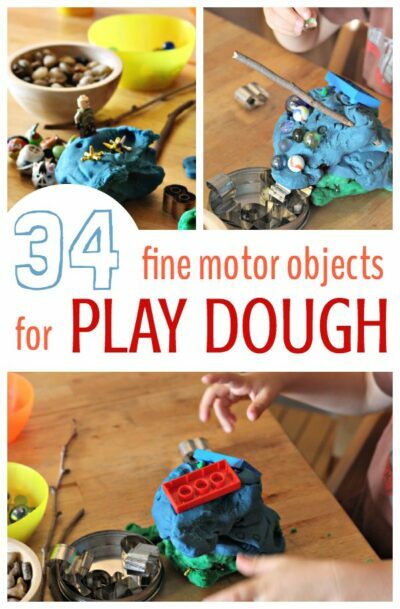 Here is a list of ideas for things you can add to your child’s play dough play. all those millions of small goodie bag fillers your child gets at birthday parties! 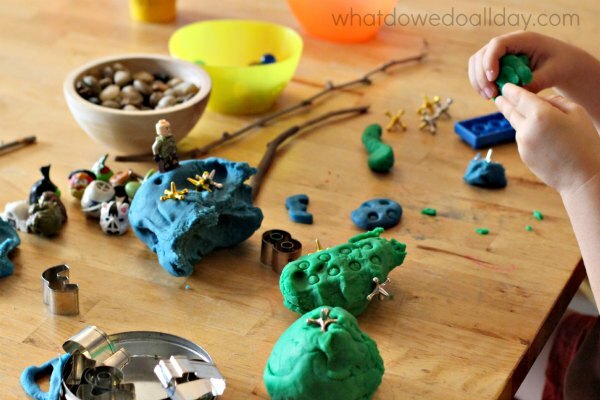 More play dough ideas your kids will love! Happy Play Dough Day! Thank you, thank you! I was wondering what I could have my son do while i cleaned the kitchen this morning and your playdoh activity was perfect. Even better that I had everything I needed in the house already. Kept him busy for 45 minutes. Then my 6 year old came home from school and she played too! Love your blog. I’m so happy to hear it worked out for you! Thanks for taking the time to leave a comment and let me know – made my day! I was catching up on my blog reading this morning and saw this wonderful post! We love play clay in this house, but I’ve never made it. I always take the easy (expensive) way out and buy it. I will have to try your recipe soon. Thanks for this and all your other lovely posts! My sons and I really love your blog! I can’t believe I have never made play dough! I am putting cream of tartar on my shopping list for reals this time! I’m not a big play dough maker, either – I was pleasantly surprised at how easy it was. I make the cooked play-dough too – but it’s extra brilliant in winter when kids get the sniffles – if you put a little eucalyptus oil into it… great smell, fresh and help clear blocked noses as they play. Thanks for putting great ideas in one spot! Love it. A little game we play that works both fine motor skills and reasoning skills is this. I hide a small toy in the play-doh, and my daughter has to try to guess what it is. I will give her some clues like “it’s yellow” or “you play with it in the bathtub.” I start with pretty vague hints and get more specific if she doesn’t get it right away. When she finally guesses, “duck!” then I say, “take a look” and she digs it out of the dough.